Trader Options - Professional Trading Made Simple! Binary options are high return, short term investments traded by both professional traders and amateurs. Based on vanilla options, which are only traded on private markets, binary options are traded over the counter and available 24 hours a day, 6 days a week. Until recently, binary option trading was not open to individual investors. The only way individuals could access binary options was to hire a binary option broker with a minimum cost of £500 up front, making it extremely difficult for many individuals to enter the market. While individual investors can still hire a binary option broker, in the past few years it has become extremely easy to directly trade binary options online, saving investors thousands of pounds..
Today some of the most successful binary option traders are individual investors and day traders who have found several ways to successfully trade online. Many individual investors manage multiple accounts and trade different types of options at the same time while others have tended to focus their investments in specific markets such as silver, gold and crude oil for example. The flexibility of time and the wide range of options has made binary option trading especially beneficial for investors who can manage their portfolios from the comfort of their home. Binary options are an excellent choice because of their high return. While most traditional stocks and options mature over time, binary options generally yield 70% – 80% or more in as little as 15 minutes. While traditional options can take years to mature, the majority of binary options expire within 1 hour to 1 week. This means that an investor can make between 170% – 180% or more on a single investment in one hour or less. If the strategy being used is sound, a trend in the market can continue to be used time and time again as long as it holds true, enabling the investor to double their investment every hour so long as the trend continues. On the other hand, if an investor would like to refine their strategy and choose another option or direction to purchase, options expire in a relatively short amount of time and on Trader Options, you can even get back a rebate of up to 15% or more of your investment to minimize your risk. This is done using our Risk-O-Meter. Binary Option is also extremely accessible to investors who want to invest small amounts of money. With binary options, an investor can follow a market trend and almost double their investment, yielding enormous profits. By diversifying carefully as profits are generated, prolonged profits can be sustained and help build a buffer against potential losses. The biggest advantage of binary option trading is that the return on initial investment is fixed. From the onset, the amount of potential profit or loss is known. This means that a trader will never lose more than they expected and can calculate their risk as perfectly as possible and that there is a cap on how much can be earned or lost in a single trade. Since the rate of return is quite high, and trade times are short, in the long run the fixed rate of a binary option can be a huge advantage. Again this would involve the use of our Risk-O-Meter to minimize your risk and give you back a rebate of 15% or more. Binary options trading has an immense advantage in volatile markets, because it offers a somewhat safe way to continue investing. While traditional investments can be rocked by the volatility of the market, and huge losses can be incurred, the fixed rates of binary options mean that no matter how drastic the market moves, the fundamental principles remain the same. This combination of a high fixed return, relatively transparent risk, and short contracts means that binary option trading can produce very high returns on an initial investment. Even a relatively small investment can, in a short period of time, produce massive profits. Sign up now for a free demo with Trader Options and start earning high profit returns for minimal investment using our state-of-the-art secure platform. Trader Options - Professional Trading Made Simple!Trader Options - Professional Trading Made Simple! 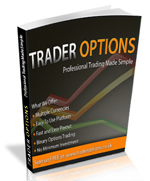 Trader Options - Professional Trading Made Simple!Trader Options - Professional Trading Made Simple!